Discover how to make your mark and wear something stunning and within the formal dress code for prom. Deciding what to wear for your prom can be a bit of a headache. With the amount of choice in the stores and online these days, the task at hand can seem almost impossible. If you aren’t sure about what style of dress to buy for your prom, this article will really help. We will cover all the bases so you know how to choose the best dress for you. Some styles of prom dresses are more common than others, depending on what’s in fashion for that season. This year, silhouettes, cut-outs and two pieces have been really popular all round but it can be a huge help to get some inspiration elsewhere. This means flicking through some magazines, checking out Pinterest or some prom dress blogs. For example, if you check out Peachesboutique.com, they have a great blog where you can flick through some ideas and start building a picture of what you want your prom dress to look like. It will help to start making your own collage/scrap book of ideas and highlighting where the best places to purchase a certain style may be. It’s good to get started with this stage from around four months before your prom date. This gives you plenty of time to get to know what you want and what you don’t. The beautiful thing is that all women’s body shapes are diverse and different. You may be a pear, hourglass, apple, athletic, petite shape or something else! How you are really going to crack the formal code and find the ultimate dress for you is by shopping in-line with your body shape. Certain gowns will complement and bring out your best features or curves. They also work to balance out the body so areas where you may be heavier, it will even things out to create a balanced overall look. Essentially, your body shape will direct the formal gown you end up buying and make your search much easier. This is because it automatically cuts out styles you know won’t flatter your figure. Thinking about which colors you love isn’t enough. You want to ensure the color of dress you choose also complements your complexion. For example, there are certain rules you should be aware of when it comes to dress shopping such as never wear a shade close to your own. Depending on whether you have a dark, medium or fair skin tone you will find certain shades will suit more than others. Find the colors that make you glow and you will be onto a winner when choosing a prom dress. Face shape is particularly important when thinking about the neckline of the dress you’re choosing. For instance, oval face shapes will be able to suit a range of necklines whereas someone with a round shape may need to look for V-necks to elongate the face. 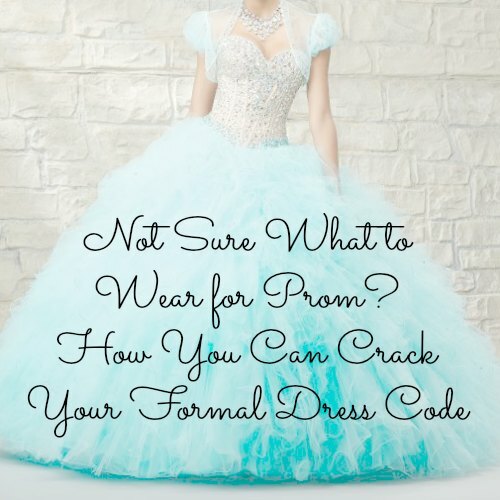 Keep these tips in mind to lock down the best formal dress code for your prom.